A great budget Strat with versatile pickups. Affordable quality from the budget kings. Great looks and a sound to match. Aside from Fender’s Stratocaster, the Gibson Les Paul is one of the most replicated electric guitars in history, with many brands using the distinctive LP shape to some effect in a wide scope of price ranges. Today we’re looking at one of the cheapest ‘real’ Les Pauls you can buy – the Les Paul Special II from Gibson’s little brother Epiphone. It’s certainly a popular model among beginners and those on a budget, but let’s see if it justifies its place on our chart of the best cheap guitars. As we’ve mentioned – and as the pictures clearly show – the Les Paul Special II is cut from the same cloth as the original Les Paul, although Epiphone do cut a few corners to make this come in at under $200. For example, the body is made from okoume (a cheap wood that’s like a light-weight mahogany) and doesn’t feature a carved top as you’d find on more expensive LPs. With a 24.74” scale length, the neck is also made from okoume and is bolted onto the guitar instead of glued in, as is traditional with the Les Paul. 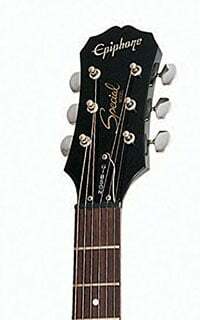 Despite this, the Les Paul Special II is a very solid guitar in both design and playability. It looks lovely with that vintage Sunburst finish on the body, while the neck offers a nice feel with a 1960s SlimTaper D profile, featuring a rosewood fretboard and 22 frets with simple dot inlays. Also, for a budget production model, the fit and finish is pretty good. Sure, it doesn’t ooze luxury like a $3,000 Gibson Les Paul, but why should it? The components that make up the hardware on the Les Paul Special II are quite basic but are very functional, and lead to a comfortable and reliable experience. 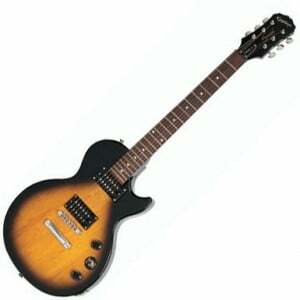 The guitar is fitted with two Epiphone-designed humbuckers, comprising a 650R at the neck with a 700T at the bridge. These two are controlled by just a master tone and master volume rotary knob, with a three-way toggle switch to choose between the two humbuckers. At the headstock you’ll find a set of sealed machine heads with a good 14:1 gear ratio and nickel buttons, while there is a tune-o-matic style fixed bridge and stopbar tailpiece, providing good adjustability and sustain. There’s no case or gig bag included (although you can find some special bundles around), but at this price we don’t really expect one. So, what does a sub-$200 Les Paul sound like? Not bad at all! Certainly enough tone for beginner’s ears, but the more experienced guitarist would also appreciate the sound on offer here. Providing you have a decent amp, you can find some good warmth and clarity, while the sustain is surprisingly lengthy. The humbuckers are well-suited towards blues and classic rock, although you can get some heavier tones too, if you know where to look. After spending a little time with the Les Paul Special II you can see why it proves such a popular instrument among beginners and intermediate players alike. Sure, it offers a genuine Les Paul design, but the playability, tone and overall feel makes it more than worthy of its price tag. 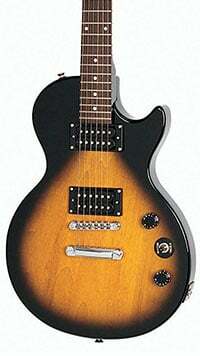 For more info about the Epiphone LP Special II, click here. For more of the best electric guitars under $200, click here. I have played a few of these. how do you play outside the comfort zone of the guitar? hard bends? lol. I have yet to see one that doesn’t stay in tune and intonated. if there is a problem there put some ground up pencil lead in the grooves of the nut. problem solved. if that doesn’t work file them smooth. the sound of the pups? subjective. I play blues on cheap guitars and expensive guitars. those knobs on the amp? use them. bottom line? logos are meaningless. in fact I was in best buy today. played a gibby lp junior and an epi lp junior. the gibby had some sharp frets. the epi had an absolutely perfect neck. I also have one of these juniors. the action is lower than my gibby lp. cork sniff much? Gibson is pretty much an empty name now. epiphones from china are becoming damn fine instruments. I simply wont pay 5 – 10 times as much for an instrument that’s equal can be found closer to the bottom of the store rack. btw, I was a guitar tech for a number of years…set em up and played em all. Great review Jim. Thank you. I just picked up an epi special ll for $50. I have played Strats all my life. The first thing I noticed was the lack of treble. Maybe that’s just a humbucker thing. I got a friend that talks a lot of crap about this guitar. Is there any famous guitarists that use this onstage? Probably not, and why would they? At $200 this is a cheap entry level Les Paul and is amazing Value. Anyone famous could probably afford and play an R9, and why wouldn’t they? But, out of curiosity I surfed the net and found that Aaron Barrett of Reel Big Fish occasionally uses this very model!!! Youtube videos are also testimonial!! I got a new one around April 2018. Fretboard was rough (!) but sanded it. Stock pups ok. Put SD Distortion in bridge and DiMarzio Air Norton in neck and it’s really fun to play.